Base colours are levelled and numbered 1-12 as you can see below 1 being the blackest and 12 being the lightest. Manufactures only do 11 and 12 as high-lift tints. Base colours have a mix of all the tones which makes them balanced. Tones are different to shades. 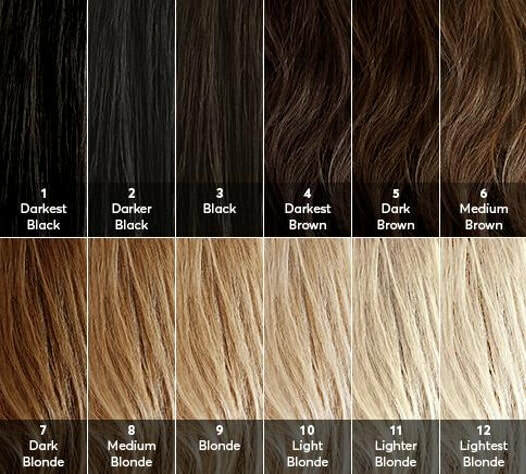 Shades are how light/dark your hair is, but tones are the colour of your hair which finishes off your hair look. Hair can have just a base colour which is a happy medium and dosn't have any preferred tone in it, which are base colours, but manufactures can also make hair colours with 3 tones in them. there is always a 'primary tone' then you can get secondary and third tones. Professionals usually mix these colours together to get a multi dimensional personalised colour for each individual. Underlying pigments are the natural pigments that make up every hair colour. When colouring hair, I must take note the underlying pigments and how they will act whether I will use or lose the pigment in the hair to achieve the desired colour for my client. If you are looking to achieve a cool beige blonde (you can see this colour on my Cool Beige/Brown page) on natural level 6 hair, I would have to lighten to lose the underlying pigment rinse and then go back in to cover up the warmth that will inevitably come out in the hair when I lighten it. Keep in mind that you'll generally have to be aware of underlying pigment when you are lightening two shades or more from the natural hair colour and warmth will come out in the colour. You won't have to worry about it when going darker than the natural level, as there will be no threat of the colour appearing or effecting your formula.